Gypsy moth undergoes four developmental life stages; these are the egg, larva (caterpillar), pupa, and adult. 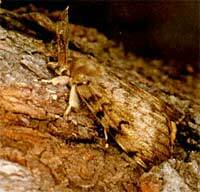 Gypsy moth females lay between 500 to 1,000 eggs in sheltered areas such as underneath the bark of trees. The eggs are covered with a dense mass of tan or buff-colored hairs. The egg mass is approximately 1.5 inches long and 0.75 inches wide. The eggs are the overwintering stage of the insect. Eggs are attached to trees, houses, or any outdoor objects. The eggs hatch in spring (April) into caterpillars. Gypsy moth caterpillars are easy to identify, because they possess characteristics not found on other leaf-feeding caterpillars. They have five pairs of blue dots followed by six pairs of red dots lining the back. In addition, they are dark-colored and covered with hairs. Young caterpillars primarily feed during the day whereas the older caterpillars feed at night. When present in large numbers, the older caterpillars feed day and night. Young caterpillars spread to new locations by crawling to the tops of trees, where they spin a silken thread and are caught on wind currents. Older caterpillars are approximately 1.5 to 2.0 inches long. 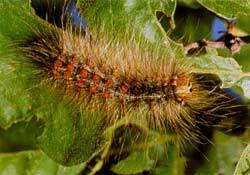 Gypsy moth caterpillars do not produce a web, which distinguishes it from web-making caterpillars such as the Eastern tent caterpillar, Malacosoma americanum and the fall webworm, Hyphantria cunea. The Gypsy moth larval stage lasts approximately seven weeks. In early summer (June to early July), Gypsy moth caterpillars enter a pupal or transitional stage. The pupae are dark brown, shell-like cases approximately two inches long and covered with hairs. They are primarily located in sheltered areas such as tree bark crevices or leaf litter. 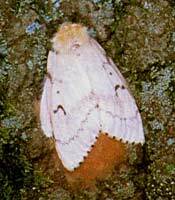 Adult Gypsy moths emerge from the pupae in 10 to 14 days. They are present from July into August. Females have white to cream-colored wings, a tan body, and a two-inch wingspan. Female Gypsy moths cannot fly. Males, which are smaller than females, with a 1.5-inch wingspan, are dark-brown and have feathery antennae. Both the adult female and male can be identified by the inverted V-shape that points to a dot on the wings. Gypsy moth has only one generation per year. Gypsy moth populations will go through cycles in which the populations will increase for several years then decline, and then increase again. Area-wide outbreaks can occur for up to ten years, but generally population densities in localized areas remain high for two to three years. Adapted from Entomology Fact Sheet, NHE-153 written by Raymond A. Cloyd and Philip L. Nixon, Department of Natural Resources and Environmental Sciences, University of Illinois, Urbana, Illinois, in cooperation with the Illinois Natural History Survey. This site is for use by municipal forestry departments, park districts, the green industry and other concerned agencies to report gypsy moth findings in NortheasternIllinois. The site will be monitored by University of Illinois Extension staff and the Illinois Department of Agriculture to assist in the effort to suppress the spread of gypsy moth.